The Warrior is a humanistic tale about a man who turns his back on violence and goes on a search for peace. Taking a cue from Clint Eastwood’s Man With No Name, The Warrior (Irfan Khan, Salaam Bombay!) is an otherwise nameless individual who seeks atonement after seeing the impact the brutal rule of his lord has had on good, innocent people. Considering the future he’s leaving for his son and his little friends, The Warrior abandon’s the lord’s army. In retribution, the lord orders the beheading of his delinquent servant. A fearful assassin brings back the head of another man with similarly long hair, and everyone is fooled. The lord then wraps things up by having The Warrior’s son killed on the spot. The Warrior, unseen, watches from a distance. Instead of seeking revenge, though, he vows to never lift a sword again. He returns to his childhood home and a peaceful way of life. But he’s followed by the assassin who knows his own life is in jeopardy as long as the real Warrior lives. The Warrior is the feature-film directing debut of Asif Kapadia. The Warrior proves that Kapadia is ready for bigger opportunities, and he gets his chance with the forthcoming The Return, which will feature a far more recognizable cast for Western audiences, including Sarah Michelle Gellar and Sam Shepard. 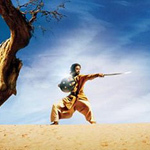 As the DVD’s supplemental materials will attest, The Warrior was a challenging production, particularly for the first-timer Kapadia. Happily, in a masochistic way, those challenges were brought about by the film’s ambitions and the decision to film on location in remote parts of the Himalayas. Featuring some stunning cinematography, the movie’s imagery is at times reminiscent of Lawrence of Arabia. Indeed, one of The Warrior’s strongest aspects is the lack of computer-generated enhancements; Kapadia is on a small budget, but he’s also smart enough to know that nature can provide its own special effects, those that no computer can make as lifelike as the real thing. Ultimately, The Warrior is an admirable piece of work that focuses more on the craft of solid filmmaking (story, characters, cinematography) than misguided mega-budget flicks like Mission: Impossible III. As described by Kapadia, the film melds European art cinema with aspects of Indian culture. In the mix, Kapadia has crafted a small gem, one that holds the promise of more treasures to come. Especially considering the relatively modest means with which The Warrior was produced, the DVD contains a great collection of supplemental materials. The running commentary by director Asif Kapadia is quite good. He offers some cultural insights into the story and even admits to suffering from brain drain after a challenging 10 weeks of filming on the road. Kapadia also recalls a brief meeting with the Dalai Lama during the shoot and sheds light on the ultimate compromise that, due to logistics, made a scene originally intended to include a cast of thousands become a scene with a cast of one. Making of The Warrior is a 45-minute documentary that incorporates a lot of raw, behind-the-scenes footage. Included are some interesting tidbits on the story’s origins but the best part is learning about the cast, many of whom had never acted before. Overall, it’s an excellent, honest look at the making of the movie. Since nobody involved is of particular marquee value, everybody can focus on talking about the making of the movie instead of the usual Hollywood platitudes. A whopping 64 minutes of deleted, extended, and alternate scenes are also included. They are not presented in anamorphic widescreen and the soundtrack is scratchy, but they’re well worth checking out. In a refreshing change of pace from the typical DVD assembly of worthless deleted scenes, many of the scenes here are pretty significant and would have made the movie even better. The deleted scenes can be watched with an optional commentary by the director. As with the feature commentary, his comments on the deleted scenes are pleasantly enlightening. The Warrior features a decent picture, in the original 2.35:1 aspect ratio, enhanced for 16x9 TVs. The Dolby Digital 5.1 surround soundtrack is also adequate. The DVD is presented in Dolby Digital 5.1 with the film’s original Hindi language track. English and Spanish subtitles are available as are English captions for the hearing impaired. The subtitles are presented out of the picture frame, which can be annoying.